Modecom MC-THC01 Car Holder For Tablets 7"-8"
Совместимые планшеты Для всех 7" и 8" размеров екранов! In order to meet the expectations of customers we have expanded product that will allow to enjoy functions of the multimedia tablets also inside their cars. 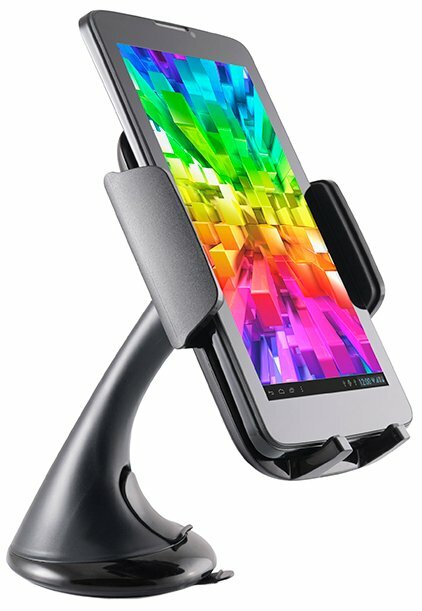 MODECOM MC-THC01 is made of highest quality materials (ABS + rubber + silicon), universal car holder dedicated to use with tablets equipped with display with diagonal in range, from 7, up to 8”. Depending on the needs, MODECOM MC-THC01 holder can be mounted either to the glass, or by using special silicone to the dashboard. Rotational structure of MC-THC01 model has been designed for most efficient and comfortable use of all necessary, (especially inside the car) functions, such us: GPS navigation, music player. Product is available in the most universal, fitted to every kind of tablet – black colour. MODECOM Modecom MC-THC01 Car Holder For Tablets 7"-8" Modecom MC-THC01 Car Holder For Tablets 7"-8"